The CONICET Oceanographic Vessel returned from an expedition to the continental shelves of Buenos Aires, Uruguay and southern Brazil, and the Malvinas and Brazil currents. The Puerto Deseado Vessel of the CONICET (BOPD) during the expedition. Photo: courtesy researcher. After ten days of expedition, on Saturday, October 12th, the Puerto Deseado Oceanographic vessel (BOPD) returned to Mar del Plata Port completing its forth campaign of the year. The expedition was organized by a large group of researchers from various Argentine and foreign institutions and different disciplines of marine sciences such as biologists, physicists and chemists. The aim of the campaign was to determine export routes for waters and typical plankton species of the continental shelf towards the deep ocean. The vessel belongs to the National Scientific and Technical Research Council (CONICET) and it sailed around the continental shelves of Buenos Aires, Uruguay and southern Brazil, and the Malvinas and Brazil currents. The expedition included the participation of 15 researchers and 7 doctoral fellows who belong to Argentine institutions: CONICET, National Institute for Fisheries Research and Development (INIDEP), Argentine Hydrographic Service, the University of Buenos Aires and the National University of Mar del Plata; from Brazil: Universidade Federal do Rió Grande; and from Uruguay: University of the Republic. 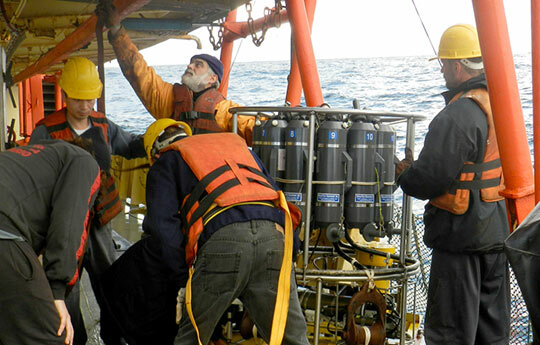 Alberto Piola, CONICET researcher and chief scientist of the campaign, explains that the expedition was organized with the objective of determining the rates and exchange processes between the continental shelf and the deep ocean. “Our interest is to establish the importance of these processes in water balance, carbon and the fate of plankton species that inhabit the rich continental shelf”. During the expedition, a number of 55 oceanographic monitoring stations and 25 trawl nets were made. “Each station consisted of vertical profiles of temperature, salinity, dissolved oxygen and fluorescence and sampling of waters at selected levels for the determination of salinity, dissolved oxygen, nutrients, chlorophyll and small fraction of plankton. The trawl net included the sampling of larger portions of plankton. The vertical profiles and the journeys among the stations also include speed records of the current”, Piola detailed. The investigator, who is a member of the project “Exportation of waters of the continental shelf throughout subtropical front shelf: a one-way ticket?”, financed by the Inter-American Institute for Global Change Research (IAI), explains that “the preliminary examination of this great group of observations reveals the injection of water of the continental shelf towards the rough waters of the Brazil-Malvinas confluence. It is less probable that the plankton species dragged by these waters out of the continental shelf could return. This situation makes their future uncertain, which motivated the title of the project”. Although the day of departure from Mar del Plata had to be postponed due to a storm that struck the region during September 30th and October 1st, the weather during the campaign was excellent, with low intensity wind during most of the journey. “The expedition was a success and it managed to achieve all the proposed objectives”, Piola concludes. The Puerto Deseado oceanographic vessel of the CONICET is operated and crewed by the Argentine Army and the Argentine Hydrographic Service. Together with the Comodoro Rivadavia Coastal Vessel, they form the Hydro Oceanographic Research Unit (UNHIDO), which is administered by the CONICET and the Argentine Ministry of Defense.